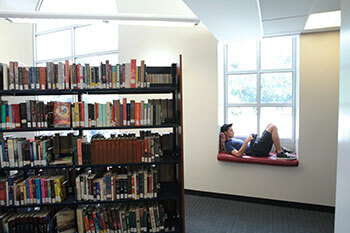 Our two-story library is open to students, faculty and staff. It is a light-filled and comfortable place to study or socialize with wonderful views of the San Gabriel Mountains. Please come to the library to work, meet with friends, read a book, check out materials or just to say hello. Chandramohan Library was opened in September 2007. The library complex is situated in the center of campus and includes 2 computer labs, a meeting room, space for individual and group study and a college counseling suite. The upstairs floor of the library is reserved for quiet study and research, while the downstairs floor is a collaborative and social place. 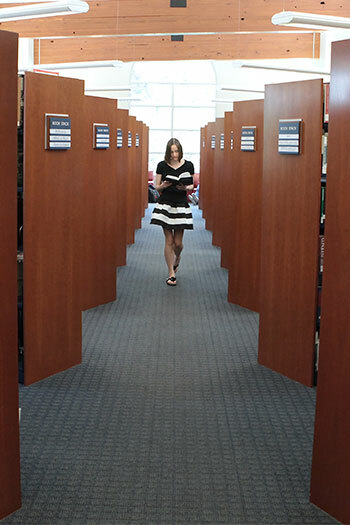 Flintridge Prep's library houses over 15,000 circulating titles, 1,000 reference volumes, and 20 subscription databases that contain various types of sources for student research. Additionally there are 5 print newspapers and 30 magazines for both research and pleasure reading. Twenty-one networked personal computers, as well as eight laptops, are available for student use. There are 20 workstations in the large library lab and 12 workstations in the small multi-media lab for class use during the school day. They are also used by the school newspaper staff, Folio staff and other groups after school.